Abstract: In this work, the Rb-Sr and Sm-Nd methods were applied to fine-grained sedimentary rock samples of the Santa Maria Formation (Triassic, Paraná Basin) in order to have provenance informations. 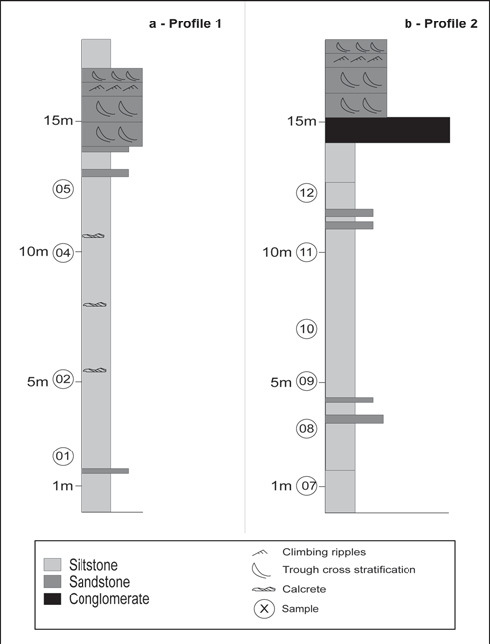 The Sm-Nd, although being considered as a new technique when applied to sedimentary rocks is an important parameter to the determination of potentials source rocks. The acquired informations with the Sm-Nd method and the integration with Rb-Sr data allowed to propose the reconstruction of the source areas concerning Santa Maria Formation. The results are fundamental to improve these methodologies when applied in sedimentary rocks. Keywords: Sedimentary rocks; Rb-Sr methodology; Sm-nd methodology; Provenance. Resumo: Os métodos radiométricos (Rb-Sr e Sm-Nd) têm sido aplicados em rochas sedimentares visando a obtenção de informações sobre proveniência. O método Sm-Nd, apesar de ser uma técnica relativamente nova quando aplicada a rochas sedimentares, tem se tornado uma ferramenta fundamental para auxílio na determinação das potenciais áreas fontes. Neste trabalho, foram aplicados os métodos radiométricos Rb-Sr e Sm-Nd em amostras de rochas sedimentares da Formação Santa Maria (Triássico da Bacia do Paraná). As informações obtidas com o método Sm-Nd e, por vezes, integradas com as da metodologia Rb-Sr permitiram inferências e reconstrução das áreas de proveniência. Estes resultados são fundamentais para o aprimoramento destas metodologias quando aplicada em rochas sedimentares. Resumen: Los métodos radiométricos (Rb-Sr e Sm-Nd) han sido aplicados en rocas sedimentarias objetivando la obtención de informaciones sobre origen. El método Sm-Nd, a pesar de ser una técnica relativamente nueva en la aplicación a rocas sedimentarias, se ha tornado una herramienta fundamental en el auxilio a la determinación de origen. En este trabajo, fueron aplicados los métodos radiométricos Rb-Sr y Sm-Nd en muestras de rocas sedimentarias de la Formación Santa Maria (Triásico de la Cuenca del Paraná). Las informaciones obtenidas con el método Sm-Nd y, por veces, integradas con as de la metodología Rb-Sr permitieron la presunción y reconstrucción de las áreas de origen. Estes resultados son fundamentales para el aperfeccionamiento de estas metodologías cuando aplicadas a rocas sedimentarias. Provenance studies of clastic sedimentary rocks are traditionally based on paleocurrent analysis and petrographically derived data (mineralogical composition and quantification). Sometimes these techniques are not conclusive when applied to sediments lacking flow indicators or having undergone extensive diagenetic processes. In this case, when the detrital composition is not diagnostic, it is possible to make inferences about the provenance indicators by using isotopic variations of the Sm-Nd system (Nelson and DePaolo, 1988). The parameters of the Sm-Nd system, such as the 143Nd/144Nd ratios, εNd and TDM model ages, are distinctive of mantle vs. crustal origin of igneous and metamorphic rocks. The relatively immobile character of the rare earth elements (REE's) in most terrestrial processes allows the application of this isotopic system for determining provenance (Nelson and DePaolo, 1988; McLennan et al., 1990), despite possible slight modifications during the sedimentary cycle (Zhao et al., 1992). The Sm-Nd system was successfully applied to Paleozoic marine basins in North America (Gleason et al., 1994, 1995) and Africa (Andersson et al., 2003), where inferences of sedimentary provenance depend on properties of the Sm-Nd system that record and preserve age information about sedimentary source rocks. Concerning some aspects, Rb-Sr isotope systematics in sediments is analogous to the Sm-Nd system. In contrast with the rare-earth ratios, Rb/Sr ratios may be strongly altered by sedimentary process, beginning with the preferential solubility of Sr during weathering (Nelson and DePaolo, 1988). Diagenetic effects can also perturb the Rb-Sr system. So, it is possible that Rb-Sr fractionation during the sedimentary process change or destroy age information about the source rocks. In order to test the applicability of the Rb-Sr and Sm-Nd systems in obtaining geologically significant provenance tracing, fine-grained sedimentary rocks from the Triassic Santa Maria Formation were sampled and analyzed. The Santa Maria Formation was selected because of its well-known sedimentology and stratigraphy (Pierini, 2001), as well as the good preservation and knowledge of the vertebrate fossil content (Scherer et al., 2000). The Paraná Basin occupies an area of 1,700,000 km2, covering part of the territories of Brazil, Argentina, Paraguay and Uruguay (Figure 1). Its basement is made up of Archean/Paleoproterozoic cratonic nuclei and Neoproterozoic mobile belts amalgamated in the context of the Brasiliano/Pan-African cycle (900-540 Ma) during the assembly of Gondwana. The tectonostratigraphic evolution of the Paraná Basin is closely related to the geodynamic processes occured in the Gondwanides belt, during the subduction of the Panthalassan plate underneath the southwestern margin of Gondwana (Milani, 2000). Figure 1. 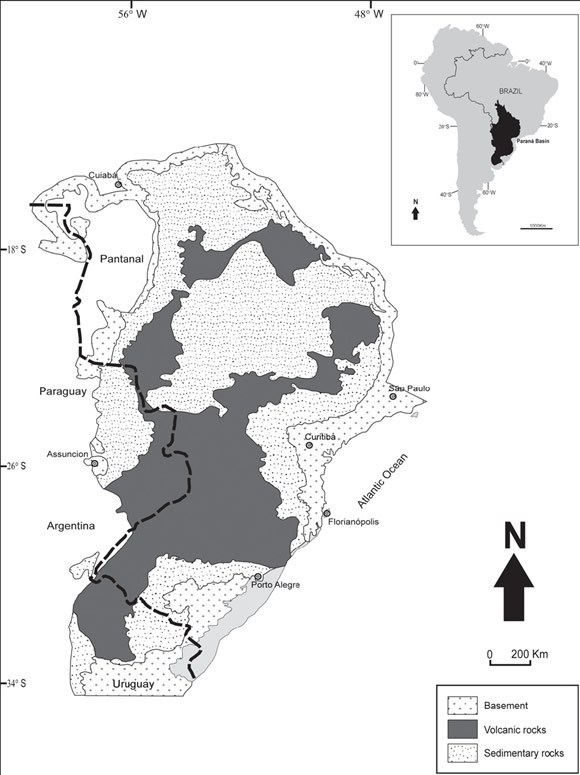 Location map of Paraná Basin (modified Milani et al., 1997). Figura 1. Mapa de localização da Bacia do Paraná (modif. de Milani et al., 1997). The geological record of the Paraná Basin is divided into six supersequences bounded by regional-scale unconformities, each one produced by a different paroxism of the Gondwanides belt. The Ordovician-Silurian (or Rio Ivaí) supersequence comprises the fluvial deposits of the Alto Garças Formation, the glacial facies of the Iapó Formation and the transgressive marine deposits of the Vila Maria Formation, dated at the Llandoverian (Mizusaki et al., 2002). The Devonian (or Paraná) supersequence is composed by the Furnas and Ponta Grossa formations, made up of fluvio-deltaic to marine deposits and recording a trangressive event. During the Devonian-Carboniferous boundary, the Paraná Basin was affected by a very unstable period due to a long glaciation (Caputo and Crowell, 1985) and to convergent tectonic processes which resulted in a regional angular unconformity representing a large non-deposition hiatus (Milani, 2000). At the end of the glaciation, sedimentation was resumed and the Carboniferous-Eotriassic (or Gondwana I) supersequence developed. This 2,500 m thick package, at its base, is made up of the diamictites, sandstones and siltstones/mudstones of periglacial origin of the Itararé Group. Stratigraphically above, occur the coal-bearing fluvio-deltaic deposits of the Rio Bonito Formation, and the transgressive marine deposits of the Palermo and Irati formations (Holz and Carlucci, 2000). A new continentalization trend is represented by the Serra Alta, Teresina, and Rio do Rasto formations, which culminates with fluvio-eolian deposits (Menezes, 2000). The Neotriassic (or Gondwana II) supersequence, the main focus of this study, crops out only in the southern portion of the basin, in the Rio Grande do Sul State, Brazil. This package is made up of the Sanga do Cabral, Santa Maria, Caturrita and Mata formations, all deposited in a continental, fluvio-lacustrine setting (Scherer et al., 2000). Stratigraphically above, the Jurassic-Eocretaceous (or Gondwana III) supersequence is composed by the eolian sandstones of the Botucatu Formation and by the tholeiitic basaltic flows of the Serra Geral Formation, with subordinated andesites and rhyolites (Roisenberg and Viero, 2000). Finally, the Neocretaceous (or Bauru) supersequence is represented by the fluvial deposits of the Bauru and Caiuá formations, accummulated in depressions formed by the cooling of the Cretaceous basaltic flows. The sedimentary rocks of the Gondwana II supersequence, cropping out in the central lowlands of the Rio Grande do Sul State, southern Brazil, were extensively revised by Scherer et al. (2000) and Zerfass et al. (2003, 2005) in terms of sedimentology, stratigraphy and tectonics. The cited authors subdivide this package in unconformity-bounded depositional sequences, with depositional ages determined through their fossil content. The Eoscytian sequence corresponds to the Sanga do Cabral Formation, which base is composed by poorly sorted intraformational conglomerates and conglomeratic sandstones, with trough- and planar-cross stratifications, suggesting deposition in braided fluvial streams. Upsection, siltstones and mudstones occur, with inter-layered fine-grained rippled sandstones and desiccation cracks, representing deposition in a periodically dry lacustrine setting. At the top of this package, coarse-grained and conglomeratic sandstones crop out, associated with fine-grained sandstones, with either horizontal stratification or large scale eolian trough-cross stratification. Paleocurrents point to northeast and the fossil content is composed by reptiles and amphibia of the Eoscytian Lystrosaurus biozone. The Ladinian-Eonorian sequence, main focus of the present paper, corresponds in the lithostratigraphy to the Santa Maria Formation and to the base of the Caturrita Formation. The sequence begins with fine-grained to conglomeratic sandstones and sub ordinate reddish siltstones and mudstones, diagnostic of braided fluvial streams (the Passo das Tropas Member). Stratigraphically above (the Alemoa Member), massive or thinly laminated siltstones dominate, associated with desiccation cracks, caliches and paleosols. These characteristics suggest the dominance of floodplain areas over the fluvial channels, which should be more sinuous and with stable margins. Upsection (the Caturrita Formation), coarse-grained sandstones are more common, suggesting a new braided fluvial system, with wide and shallow channels. Paleocurrents suggest a northeastward flow, and a rich Ladinian to Eonorian paleotetrapod fauna, associated with plant fossils and invertebrates is recorded. The Rethic sequence, represented by the "Mata Sandstone", comprises fine-grained to conglomeratic quartzose sandstones, with small- to medium-scale trough-cross stratifications. These rocks contain a significant occurrence of silicified fossil conifer stems. The Neojurassic sequence is represented by the Guará Formation (Scherer and Lavina, in press), a succession made up of fine-grained to conglomeratic sandstones, with trough-cross and horizontal stratifications. A progressive southwards grain-size decreasing, associated with consistent southward paleocurrents, suggest that the basin depocenter, at that time, was located in Uruguay, where the correlated Taquarembó Formation contains gastropoda, reptiles and fishes of Late Jurassic age. The Gondwana II supersequence is unconformably overlain by the Cretaceous eolian sandstones of the Botucatu Formation and by the basaltic lava flows of the Serra Geral Formation. During the Mesozoic, the basement of the Paraná Basin in its southern portion was represented by the igneous, metamorphic and sedimentary units of the Sul-rio-grandense Shield, with formation ages from the Late Archean to the Ordovician. This area developed through accretionary and collisional events during the Transamazonian (Paleoproterozoic) and Brasiliano/Pan-African (Neoproterozoic) orogenic cycles (Chemale Jr. et al., 1995; Fernandes et al., 1995; Babinski et al., 1996; Hartmann et al., 1998). Tectonic activity during the Paleozoic and Mesozoic was identified by means of petrographic analysis of sandstones (Zerfass, 2000), identification of tectonic structures (Zerfass et al., 2005) and apatite fission-track data (Borba et al., 2002, 2003a). Thus, a detailed description of the isotopically-distinct basement domains of the Sul-rio-grandense Shield is necessary for comparison with the obtained data and identification of possible source areas. The Taquarembó Domain comprises the Paleoproterozoic Santa Maria Chico granulitic complex, of juvenile island-arc TTG origin. The magmatic ages are between 2.55 and 2.35 Ga, and a 2.02 Ga old metamorphic overprint is recorded. Initial 87Sr/86Sr ratios are very low (ca. 0.703) and Sm-Nd isotopic data reveal TDM ages between 2.3 and 2.6 Ga and εNd(t) around +3 (Hartmann et al., 1999; Soliani Jr. et al., 2000). The São Gabriel Domain consists of a Neoproterozoic juvenile terrain made up of TTG-type metagranitoids of the Cambaí Complex, with magmatic ages ranging from 879 ± 14 Ma to 703 ± 13 Ma (Leite et al., 1998). Initial 87Sr/86Sr ratios are also very low and Sm-Nd model ages vary between 930 and 800 Ma and εNd(t) values between +0.7 and +4.4 (Babinski et al., 1996). Remnants of oceanic crust, island-arc volcanics and sedimentary cover are assembled in the Vacacaí Super-complex, also with juvenile characteristics, unit which is dated at 753 ± 2 Ma and 705 ± 2 Ma (Machado et al., 1990; Hartmann et al., 2003; Saalmann et al., 2005). The Santana da Boa Vista Domain is made up of the Paleoproterozoic Encantadas gneisses (Jost and Bitencourt, 1980), with Sm-Nd TDM ages of 2.0 to 3.2 Ga and εNd(t) of +5 (Soliani Jr. et al., 2000). This unit is unconformably overlain by the supracrustal Porongos complex, with Neoproterozoic metamorphosed volcanic rocks (783 ± 6 Ma, Porcher et al., 1999) and sedimentary units of Paleoproterozoic provenance (Vasconcellos et al., 2003). The Pelotas Domain is made up of granitic rocks emplaced within a major shear zone (the Dorsal de Canguçu shear zone, DCSZ), active between 658 - 625 Ma under transpressive regime, and 625 - 600 Ma under transtractive regime. 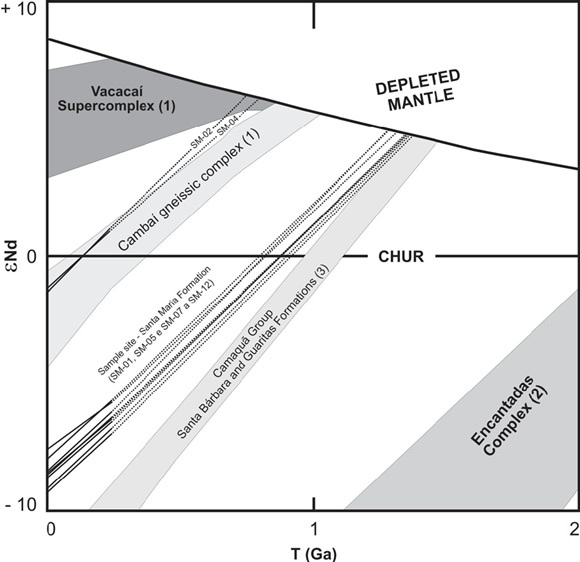 These granitoids display mixed mantle-crust Sm-Nd data (TDM ages between 1.53 and 2.27 Ga, Frantz et al., 1999). Post-collisional (Bitencourt and Nardi, 1993) intrusive suites outside DCSZ are younger than 612 ± 2 Ma and are rich in Paleoproterozoic metamorphic xenoliths (Babinski et al., 1997; Philipp and Machado, 2002). Large Paleoproterozoic xenoliths and roof-pendants are ascribed to the Várzea do Capivarita metamorphic suite (Frantz et al., 1984) and the Arroio dos Ratos gneissic complex (Fernandes et al., 1990). A recent proposal suggests an allochthonous origin for the Pelotas Domain (or Cuchilla Dioniso Terrane in Uruguay) and a 530 Ma left lateral (strike-slip) collisional event (Bossi and Gaucher, 2004). The "Camaquã Basin" (Paim et al., 2000), designation of a series of fault-bounded sedimentary and volcanosedimentary basins, represents the post-collisional phase of the Neoproterozoic orogenic events. From base to top, the stratigraphic units represent an overall continentalization trend. The Maricá Formation (Leinz et al., 1941), considered to be Neoproterozoic (Paim et al., 2000), is made up of fluvial and shallow marine sedimentary rocks (Borba et al., 2004) with crustal, Paleoproterozoic Sm-Nd parameters (Borba et al., 2006). The Bom Jardim Group comprises andesites of the Hilário Formation (ca. 592 ± 5 Ma, Remus et al., 1997) and alluvial, fluvio-lacustrine deposits of the Arroio dos Nobres Formation. 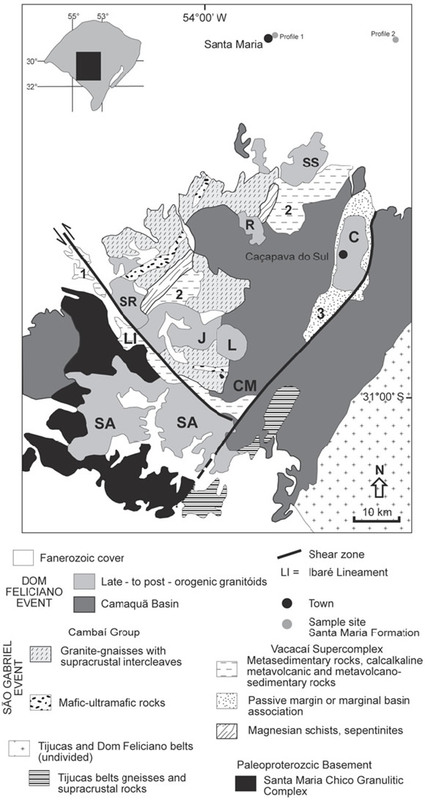 The Acampamento Velho Formation is made up of rhyolitic lavas and pyroclastic rocks dated at 549 ± 5 Ma (Sommer et al., 2003), and the Camaquã Group comprises the alluvial, fluvial and eolian deposits of the Santa Bárbara and Guaritas formations, younger than 540 Ma (Borba and Mizusaki, 2003b; Scherer et al., 2003). Shoshonitic to alkaline granitoids with ages in the 590 - 550 Ma interval (e.g. Lavras do Sul, Jaguari, Caçapava do Sul, São Sepé granitoids) are widespread in the entire Sul-rio-grandense Shield. The Rb-Sr dating method is related to the process of radioactive decaying of 87Rb to 87Sr, with a half-life value of 48.8 Ga, and it is traditionally applied to the absolute dating of igneous suites. During the crystallization of a magma, 87Sr has considerable mobility, and it migrates between mineral phases when the temperature is above 300 - 350ºC. The result is called the isotopic homogenization of Sr, which is stopped by the cooling of the formed rocks below the referred temperature. Thus, a Rb-Sr age records the crystallization of a given igneous suite. An important parameter of the Rb-Sr system is the initial 87Sr/86Sr ratio (Ri), which distinguishes acidic, crust-derived igneous rocks, with higher R-i values, from basaltic, mantle-related suites, with Ri around 0.703. The Rb-Sr dating of a single granite sample, analyzed by mass spectrometry, can be obtained by attributing an initial 87Sr/86Sr ratio (conventional age). Otherwise, when Ri is unknown, the obtained 87Rb/ 86Sr and 87Sr/86Sr ratios for a series of co-magmatic samples are plotted in the isochron diagram, the slope of the best-fitting line meaning the crystallization age. During the sedimentary cycle, characterized by lower temperatures, the behavior of the Rb and Sr ions is different. This difference is associated to the sedimentary process beginning with preferential Sr solubility during weathering. Rb is more easily adsorbed by clay minerals, while Sr is released from the crystal lattice of the minerals, and incorporated to the interstitial fluids. This fact is thought to favor a process called the "isotopic uniformization" of Sr during the deposition of fine-grained sediments in a sedimentary basin (Compston and Pidgeon, 1962; Faure, 1986). In this case, there is a tendency to the 87Sr/86Sr ratio of the samples became very homogeneous especially when the sediments are fine grained and the mineralogical composition is enriched in expansive clay minerals. The relatively immobile character of the rare earth elements (REE's) in most terrestrial processes (DePaolo, 1988; McLennan et al., 1990) allows the application of the Sm-Nd isotopic system to provenance research, even considering a possible slight modification of parameters during the sedimentary cycle (Awwiller and Mack, 1991; Zhao et al., 1992). Relatively lower 143Nd/144Nd ratios (144Nd is the reference stable isotope) indicate crustal sources, while higher 143Nd/144Nd ratios suggest the input of mantle-derived juvenile material (DePaolo, 1988). The difficult visualization of the meaning of Nd ratios is overcome by the εNd parameter and by mantle extraction ages TDM. Positive or near-zero εNd values, and TDM values near the crystallization age of an igneous suite, correspond to juvenile, mantle-derived components. On the other hand, negative results and significant difference between ages of extraction (TDM) and crystallization point to contamination by inherited, crustal material. The early study of Nelson and DePaolo (1988) in continental, semi-arid, fault-bounded basins of the Tertiary of southwestern United States demonstrated the applicability of the parameters cited above to provenance studies by recognizing two isotopic end-members (Precambrian basement and Oligocene volcanics) and their mixing in post-Oligocene rocks. McLennan et al. (1990) showed that recent sediments draining shield areas and depositing in passive margin basins have strongly negative, present-day εNd parameters (between-9,9 and -24,9), while sediments from fore-arc basins display positive values from +0,7 to +8,3. The Sm-Nd parameters have also been applied to Paleozoic marine basins in North America (Gleason et al., 1994; 1995) and Africa (Andersson et al., 2003), as well as to Neoproterozoic sedimentary (Ball and Farmer, 1998; Farmer et al., 2001) and metasedimentary (Pimentel et al., 2001) successions. 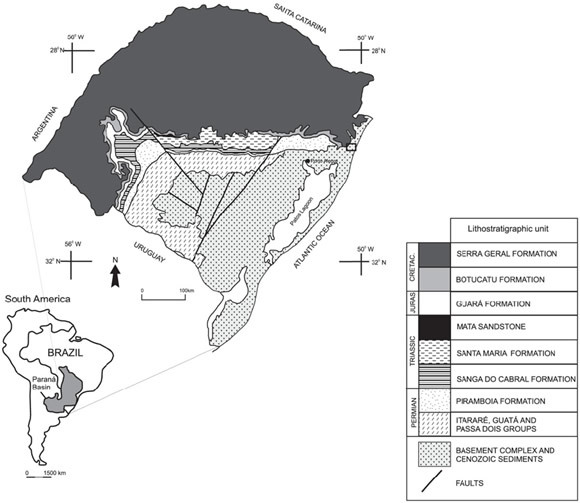 The analyzed samples are representative of the upper package of the Santa Maria Formation, the Alemoa Member, comprising siltstones with desiccation cracks, caliches and paleosols, cropping out along a E-W trending area in the central lowlands of Rio Grande do Sul State, southern Brazil (Fig. 2). Sample collection was performed along two distinct stratigraphic sections, with slightly different grain-size, distant some 50 kilometers from one another in the E-W direction. In the first profile (Fig. 3a), located near the urban area of Santa Maria city, samples SM-1 to SM-5 were collected, while in the second (Fig. 3b), located near Agudo, samples SM-7 to SM-12 were obtained. All the twelve samples were analyzed for Rb-Sr, while ten samples were submitted to Sm-Nd procedures. The selection of samples was performed according to the criteria of Mizusaki (1992), by considering macroscopic characteristics and previous results by X-ray diffraction (Pierini, 2001). Figure 2. Geological map of Paraná Basin in Rio Grande do Sul state (modified Scherer et al., 2000). Figura 2. Mapa geológico da Bacia do Paraná no estado do Rio Grande do Sul (modif. de Scherer et al., 2000). Figure 3. 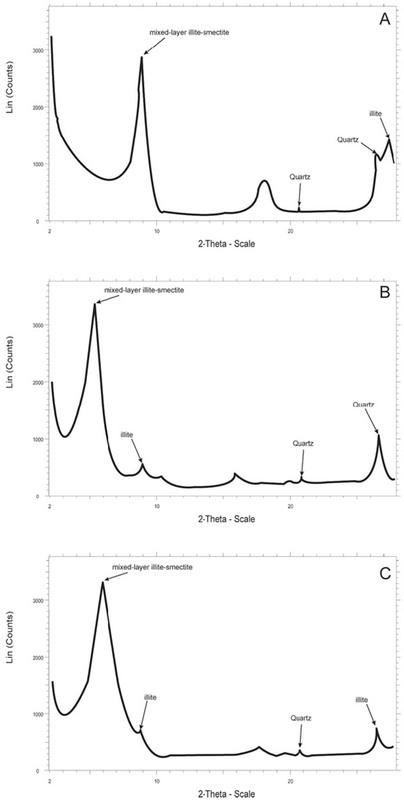 Stratigraphic profile of Santa Maria Formation samples; a) profile 1, samples SM-01 a SM-05; b) profile 2, samples SM-07 a SM-12 (modified Pierini, 2001). Figura 3. Perfil estratigráfico das amostras da Formação Santa Maria; a) perfil 1, amostras SM-01 a SM-05; b) perfil 2, amostras SM-07 a SM-12 (modif. de Pierini, 2001). The Rb-Sr and Sm-Nd isotopic analyses were performed in the Laboratório de Geologia Isotópica of the Universidade Federal do Rio Grande do Sul (LGI-CPGq/ UFRGS). Initially, the samples were dried under controlled temperature (up to 70ºC) in order to avoid damage to the structure of the clay minerals. The semi-quantitative and quantitative determination of the Rb, Sr, Sm and Nd contents was achieved by X-ray fluorescence. About 0.1 to 0.2 g of powdered rock from each sample was dissolved with HNO3 and HF in Savilex vials, with the addition of isotopic tracers. Rb, Sr and REE's were separated in cationic exchange AG-50W-X8 resin columns (200 to 400 mesh), and Sm was separated from Nd with anionic exchange LN-B50-A resin columns (100 to 200 mm). Isotopic ratios were obtained using a VG SECTOR 54 mass spectrometer, with multi-collection system and 1.0 V ion beam, at the Laboratório de Espectometria de Massas do LGI-CPGq/UFRGS. Rb-Sr and Sm-Nd results were calibrated respectively against standards NBS-987 (Strontium carbonate, mean 0.71026 ± 0.000014) and La Jolla (mean 0.511859 ± 0.00001). Blank values were lower than 150 pg for Sr and Sm, and 750pg for Rb and Nd. The analyzed samples can be described as reddish, oxidized, massive siltstones. Their close field relationship with lens-shaped sandstone beds, as well as the stratigraphic position within the Ladinian-Eonorian sequence, relate them with floodplain deposits of a fluvial system. The siltstones are usually well to moderately sorting and are classified as arkoses concerning McBride's (1963) scheme. Quartz, feldspar and lithic fragments are the main framework constituents. Lithic fragments embrace about 12% of detrital grains, with altered volcanics being common in most samples. Metamorphic, chert and intrabasinal grains (mostly mudclasts) are also described representing about 2% of the detrital composition (Pierini, 2001). In most cases, the samples do not feature any important diagnetic event. However, it is common the precipitation of authigenic, reddish brown iron oxides. Occasionally the iron oxides form distint levels that can more clearly be observed in the most fine grained, well laminated samples or between the detrital grains. The X-ray diffraction procedures in the FF < 2μm fraction of the samples allowed the recognition of discrete illite and illite-smectite (I/S) mixed-layered clay minerals with minor amounts quartz (Fig. 4). Figure 4. X-ray diffraction patterns to sample SM-4, Santa Maria Formation. a) Normal sample; b) Glicolated sample; c) Calcinated sample (modified Pierini, 2001). Figura 4. Difratogramas da amostra SM-4, Formação Santa Maria. a) Amostra normal; b) Amostra glicolada; c) Amostra calcinada (modif. de Pierini, 2001). The results of the application of the Rb-Sr and Sm-Nd isotopic methods in whole rock are in Table I. In the first profile, Rb values are between 103 and 119 ppm, Sr varies from 85 to 116 ppm, Sm from 4 to 10 ppm and Nd between 22 and 50 ppm. The 87Sr/86Sr ratio spreads from 0.722 to 0.728, while the 87Rb/86Sr ratio are between 2.60 and 4.03. The values for the 147Sm/144Nd ratio are from 0.191 to 0.203, and the 143Nd/ 144Nd spreads from 0.5121 and 0.5125. These results correspond to εNd(0) values of -1.27 to -9.18, andεNd(t) from +0.91 to -6.95, considering the depositional age of 230 Ma. The TDM ages spread from 750 to 1360 Ma. Table 1. 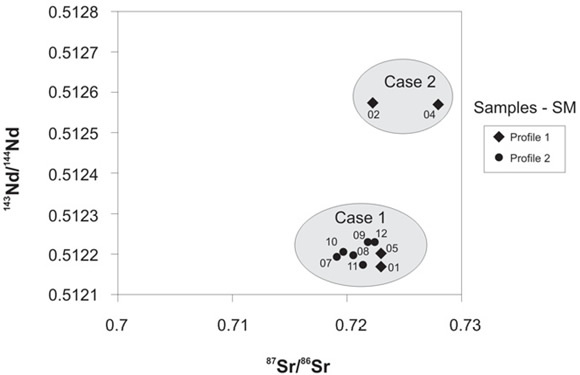 Isotope ratios of Santa Maria Formation samples (errors values of the isotope ratios are presented in absolute SD). * samples refered to profile 1. Tabela 1. Razões isotópicas das amostras da Formação Santa Maria (os valores dos erros das razões isotópicas estão em SD absoluto). * amostras referentes ao perfil 1. In the second profile, Rb values are between 85 and 133 ppm, Sr between 109 and 163 ppm, Sm from 3 to 5 ppm and Nd from 17 to 25 ppm. The 87Sr/86Sr values spread from 0.719 to 0.722 and the 87Rb/86Sr from 1.83 to 2.55. The values of the 147Sm/144Nd ratio are from 0.189 to 0.198, and the 143Nd/144Nd spreads from 0.5121 and 0.5122. These results correspond to εNd(0) values of -7.98 to -9.07, and εNd(t) from -5.75 to -6.84 (t=230 Ma). The obtained TDM ages are between 1280 and 1365 Ma. Provenance studies are capable of reconstructing the tectonic, geographic and climatic parameters of a given sedimentary basin. The most widely used provenance tools are conglomerate clast-counting, sandstone petrography (modal counting of detrital components), and geochemical analyses. Isotopic analyses by the Rb-Sr and Sm-Nd systems can also contribute in the identification of source areas for sediments and sedimentary rocks (Nelson and DePaolo, 1988; McLennan et al., 1990), especially those deposited under dry climatic conditions, where erosion and transport are dominated by physical instabilization and ephemeral, short-lived, high-energy subaqueous flash-floods. The Gondwana II Supersequence of the Paraná Basin, which corresponds to the Triassic section of southern Brazil, comprises the Sanga do Cabral, Santa Maria, Caturrita and Mata formations, deposited in fluvial and lacustrine systems (Scherer et al., 2000), in a rift basin with preferential transport to north-northeast. The Santa Maria Formation is subdivided in the Passo das Tropas (basal sandstones) and Alemoa (upper siltstones and shales) members. The analyzed samples are positioned at the base of the Alemoa Member, interpreted as deposited under floodplain and ephemeral lakes (Pierini, 2001) periodically dried (mudcracks, calcretes). The deposition of the Alemoa Member was processed during the Ladinian-Carnian interval, and then the reference age of 230 Ma was used for the calculation of εNd(t). In the first profile, located near the town of Santa Maria, the SM-1 and SM-5 samples yielded negative values of 87Sr/ 86Sr, from 0.72298 and 0.72296, 143Nd/144Nd of 0.512168 and 0.5122, εNd(t), of -6.39 and -6.95, corresponding to TDM of around 1.3 Ga. On the other hand, the samples SM-2 and SM-4 yielded positive values of 87Sr/86Sr, from 0.72807 and 0.72229, 143Nd/144Nd of 0.512568 and 0.512573, εNd(t), from 0.81 to 0.91, corresponding to TDM ages from 750 to 800 Ma. In the second profile, distant some 50 km eastward, near the town of Agudo, a more significant uniformity of values was observed, with all samples showing negative εNd(t) values, from -5.75 to -6.84, 87Sr/86Sr of 0.71921 to 0.72242, 143Nd/ 144Nd of 0.512173 to 0.512231 and TDM ages around 1.3 Ga (Fig. 5). Figure 5. Geological map of Cinturão Vila Nova and Bloco Taquarembó (modified Chemale Jr. et al., 1995) - 1 = Complexo Ibaré, 2 = Complexo Palmas/Bossoroca, 3 = Complexo Passo Feio and CM = Cerro Mantiqueiras. Granitic massives are: C = Caçapava do Sul, SS = São Sepé, R = Ramada, SR = Santa Rita, J = Jaguari, L = Lavras and SA = Santo Afonso. Figura 5. Mapa geológico do Cinturão Vila Nova e Bloco Taquarembó (modif. de Chemale Jr. et al., 1995) - 1 = Complexo Ibaré, 2 = Complexo Palmas/Bossoroca, 3 = Complexo Passo Feio e CM = Cerro Mantiqueiras. Os corpos graníticos são: C = Caçapava do Sul, SS = São Sepé, R = Ramada, SR = Santa Rita, J = Jaguari, L = Lavras e SA = Santo Afonso. The values obtained for the SM-2 and SM-4 suggest significant contribution of mantle-derived source rocks, formed by juvenile accretion during the Neoproterozoic Brasiliano/Pan-African Cycle. The Cambaí Complex and Vacacaí Supercomplex (Fig. 6 e 7), units that compose the São Gabriel Domain, are the only units of the Sul-rio-grandense Shield to show Sm-Nd data compatible with the obtained results. Thus, these juvenile rocks were probably exposed and available for erosion during the deposition of the analyzed interval, especially in its western portion. On the other hand, the rest of the samples show values which suggest mixing of mantle-derived juvenile and crustal source areas. The Sm-Nd parameters, including TDM, are very similar to those obtained by Borba et al. (2003b) for samples of the Camaquã Group (Santa Bárbara and Guaritas formations), which could be the main sources of sediments of the studied section in its eastern part. Figure 6. Diagram åNd vs. Time (DePaolo, 1981) Santa Maria Formation samples (1 - Babinski et al., 1996; 2 - Chemale Jr., 2000; 3 - Borba et al., 2004). Figura 6. Diagrama åNd vs. Tempo (DePaolo, 1981) para as amostras da Formação Santa Maria (1- Babinski et al., 1996; 2 - Chemale Jr., 2000; 3 - Borba et al., 2004). Figure 7. Diagram 143Nd/144Nd vs. 87Sr/86Sr. Case 1 = provenance: Camaquã Group (Santa Bárbara Formation); Case 2 = provenance: Vacacaí Supercomplex/Cambaí gneissic complex. Figura 7. Diagrama 143Nd/144Nd vs. 87Sr/86Sr. Caso 1 = proveniência: Grupo Camaquã (Formação Santa Bárbara); Caso 2 = proveniência: Supercomplexo Vacacaí/Complexo Gnáissico Cambai. Concerning the 87Sr/86Sr parameter it is possible to observe that all values are around 0.719 to 0.722 (Table I), the exception being sample SM-02 (0.72807). As the 87Sr/86Sr ratio may be altered by sedimentary process, specially the preferential solubility during weathering it is possible to say that Santa Maria samples are under an Sr isotopic uniformization process in order to show these homogeneous values (Cordani et al., 2004). This behavior is related to the fine grained samples, mineralogical composition rich in expansive clay minerals and depositional system. So, the 87Sr/86Sr ratio does not indicate provenance but conditions associated to the sedimentary deposition. The sample SM02 is possible contaminated by the presence of detrital minerals as the Rb/Sr ratio is very high when comparing with the analyzed samples. In summary, it can be suggested that rock units located in the Sul-rio-grandense Shield, such as the Vacacaí, Cambaí and Camaquã units, were uplifted and available for erosion during the evolution of the Alemoa siltstones of the Triassic rift of southern Brazil. Evidences for uplifting during the Triassic were obtained previously by means of apatite fission-track thermochronology (Borba et al., 2002, 2003a) and structural analysis (Zerfass et al., 2005). The uplifted area, possibly bounded by NW-SE trending structures, would be composed, in the western portion, by juvenile rocks of the Cambaí/Vacacaí units, partially covered by sedimentary rocks of the Santa Bárbara Formation. In the east, a thicker sedimentary pile of the Camaquã Group would be the only available source rock, also limited by NW-SE faults. The Rb-Sr and Sm-Nd isotopic systems were successfully applied to siltstone and sandstones samples collected from the Alemoa Member of the Santa Maria Formation, deposited in the Ladinian-Carnian interval, Triassic (ca. 230 Ma). The provenance parameters, obtained by the Sm-Nd procedures, allowed the proposition of a configuration of paleoborders, with Brasiliano juvenile units (Cambaí/Vacacaí) exposed in the west and sedimentary rocks of the Camaquã Group (Santa Bárbara Formation) available for erosion to the east, near Caçapava do Sul. The 87Sr/86Sr ratio when applied as provenance indicator is not very conclusive especially to fine grained rocks as the Santa Maria samples. In this special case, there is possibility that an Sr isotopic uniformization process is being observed. Then, the 87Sr/86Sr ratio is useful to dating sedimentary process as deposition or diagenesis (Cordani et al., 2004; Mizusaki et al., 2002). Therefore, when associated with others provenance indicators as the 143Nd/144Nd ratio, it is a secondary information aiming inferences about the possible source rocks to the sedimentary unit analyzed. The authors acknowledge all colleagues that make possible the realization of this research. The first author also acknowledge PETROBRAS (Brazilian Oil Company) for his Master Scholarship. We thanks to Dr. Rommulo Vieira Conceição (Geoscience Institute/ UFRGS) by his important contributions and discussions concerning isotope geology. We also are in debt with Dr. Shane Tyrrell (University College Dublin, Ireland) by the comments and suggestions that improved this work.